Ashok Hardware and Allied Products (AHP) was established in the year 1966 by late Mr.Tolaramji Choraria. The company is located in Park Town, Chennai and it's successfully emerging in the business through hard work & commitment. AHP has been in the business over 4 decades and established its mark in the commercial / consumer industry through quality products & customer service. AHP has never sacrifice the quality to gain the profits. 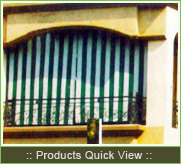 Today, AHP is amongst the largest stockist & dealers of TUFLEX, Saint-Gobain, Screen All, SkyNet, ViewNet & PHIFER in Chennai. In the year 1972, the company was taken over by the present management and it’s being managed by Mr.Ashok Kumar Choraria and his son Mr.Mahaveer Choraria, holds a graduate in commerce, joined in the year 2000.